HOME > Education > What are Shadows? 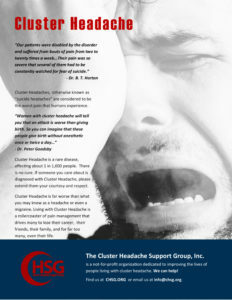 Although not part of the official diagnostic criteria, many people living with cluster headache describe a low-level persistent headache that can be a precursor to full-blown cluster headache attacks. We call these “shadows.” Read patient descriptions of this unique symptom. Several members have had mixed results with cannabinoids. The research is limited and not conclusive. Hopefully over time, we will get a clearer picture of the role cannabis, and specifically CBD, may play in treating cluster headache. You can find more information in our comprehensive list of journal articles and FAQs. I have had CHs for the past 4 years. I have discovered the use of pure Oxygen is the ONLY relief I get.